The Magic Rose Cube is a very clever and beautiful model, created by Valerie Vann. 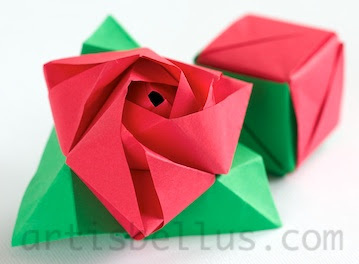 The cube blooms by lifting the paper on the faces, transforming the cube into a rose blossom. The diagrams can be found in the book Geometric Origami Kit: The Art of Modular Paper Sculpture , by M. LaFosee and R. Alexander. 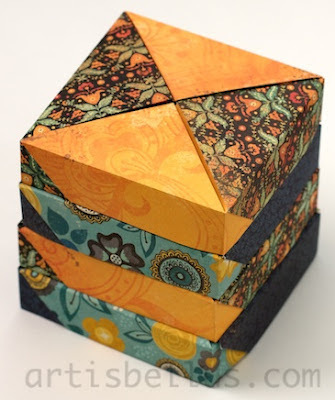 The model is designed to be folded with paper that is the same color on both sides, like copy paper (see the picture above), but it also looks nice if folded with patterned scrapbook paper (see the picture below). My best wishes for a wonderful Holiday Season, filled with warm moments and cherished memories. This Modular Cube is a Paolo Bascetta's creation. It's a very easy and fun to fold modular. The cube consists of eight corner units and twelve joint units, that I folded with 3" (75 mm) squares of origami paper. I used white origami paper for the corner units, and double-sided origami paper for the joint units. 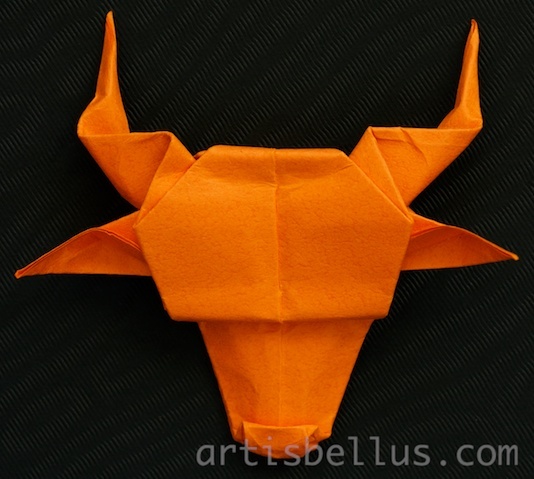 The instructions can be found in the book, Origami, by Paolo Basceta, ISBN 9788873870258 (in italian). 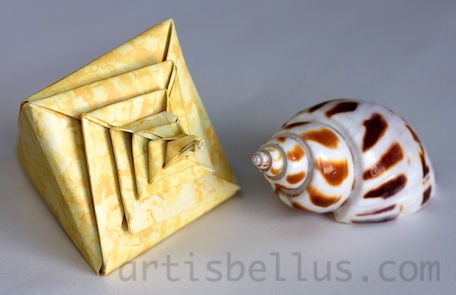 The one on the left is a Modular Spiral Shell, a model created by Tomoko Fuse. The diagrams for the Modular Spiral Shell can be found in Tomoko Fuse's book, Spirals, ISBN 9783941327061. 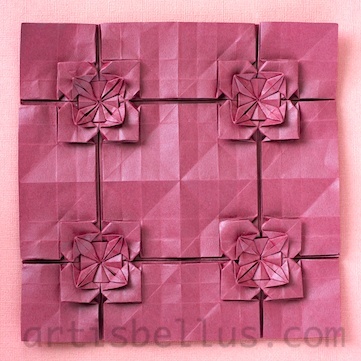 I folded it with four 6" (150 mm) squares of scrapbook paper. 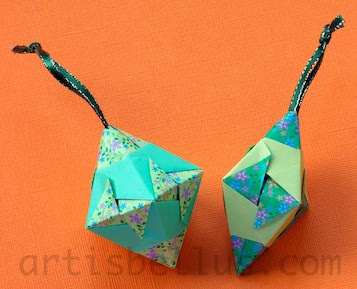 Origami modulars make great Christmas Tree Ornaments. The modulars in both pictures were constructed with the same module, created by Paolo Bascetta. The instructions can be found in his book, Origami, ISBN 9788873870258 (in italian). The ones in the first picture consist of 5 modules (the one on the left) and 4 modules (the one on the right); the modular star in the second picture consists of 30 modules. 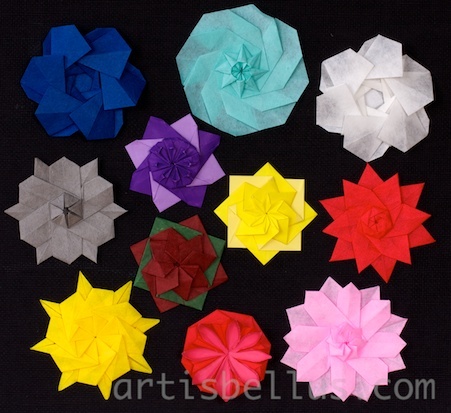 I folded them with 3" (75 mm) double-sided origami paper. 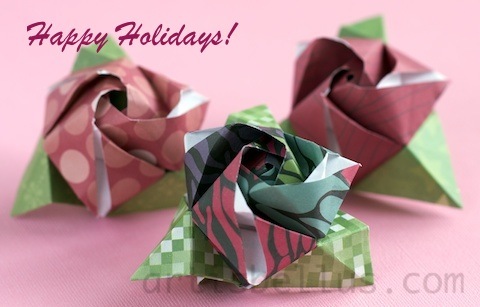 Origami modulars can be fun and inexpensive gifts for the Holidays. They will look great if folded in nice papers and packed in matching origami boxes. Calendar "Pentagon" in a Tsuzura box (wicker clothes-box). Modular Cube with pyramids in a Tsuzura box (wicker clothes-box). The Calendar "Pentagon" was originally designed by Tomoko Fuse, and designed as a calendar by Sara Giarrusso and Ramin Razani. You can find printable patterns, instructions, and more information about the calendar, in the Origami Deutschland diagrams page. The Modular Cube with pyramids is a Sonobe cube, with inserts designed by Kunihiko Kasahara. 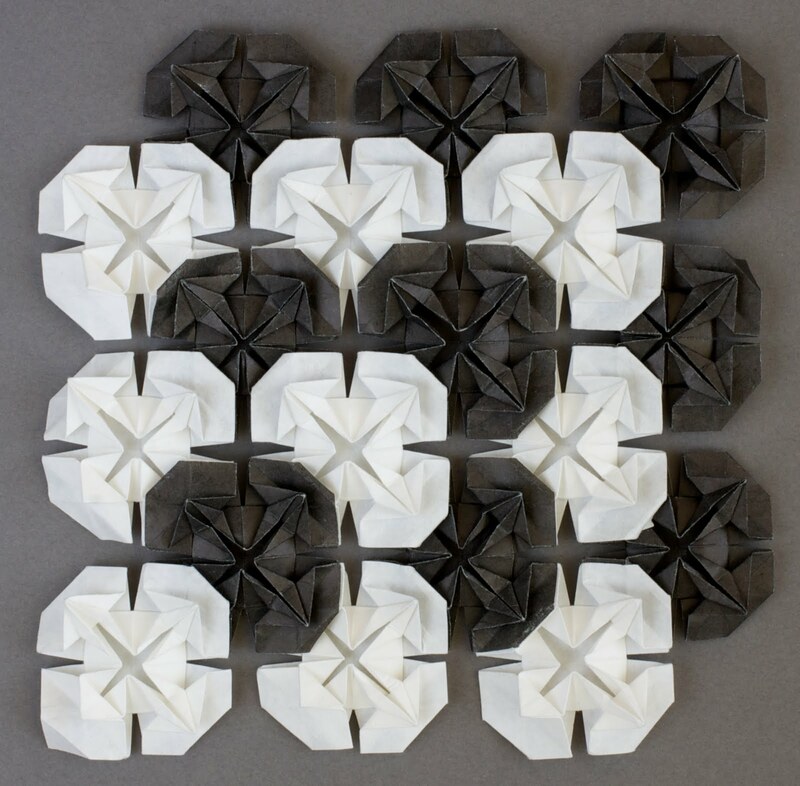 The instructions can be found in the book Unit Origami: Multidimensional Transformations , by Tomoko Fuse. The Tsuzura box is also a Tomoko Fuse's design. 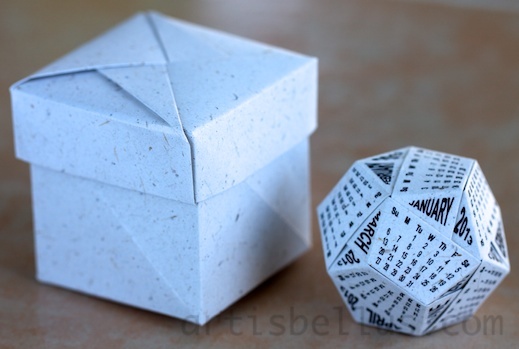 The instructions can be found in her book Origami Boxes . I folded all the models with New Leaf Premium Banana Fiber Paper . For the calendar I used the diagram called "Dodecahedron" large - 2013. Instead of printing one page per sheet, I printed four pages per sheet in landscape orientation, in letter size paper, so I got a smaller calendar (even smaller than the "Dodecahedron" small - 2013). 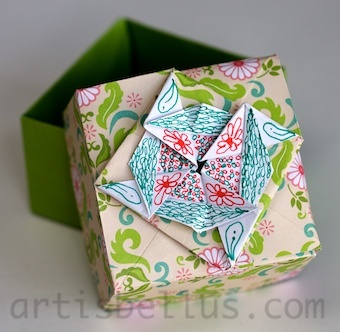 I used 7" (175 mm) squares for its tsuzura box. I used 4" (100 mm) squares for the modular cube with pyramids, and 8½" (213 mm) squares for its tsuzura box. I made a variation of my model Pumpin Tato (click here to see my previous post), that does not require to use ribbons to keep it closed. 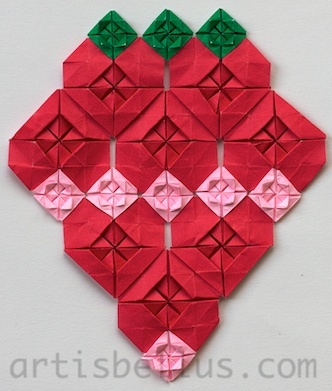 The tatos in the picture were folded with 8"(200 mm) squares of scrapbook paper. 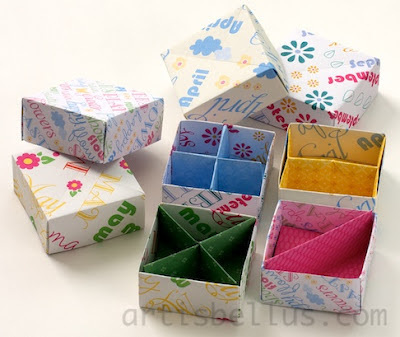 Many origami boxes show the two sides of the paper. 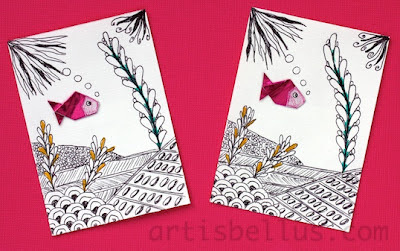 My favorite paper for boxes is scrapbook paper, but sometimes it's not easy to find one that has a color or a pattern on both sides. As an alternative, I decorated the white side of the paper with some drawings, as shown in the picture below. The box was designed by Tomoko Fuse. The instructions are available in her book, Origami Boxes from a Single Sheet, ISBN 4480872035 (in Japanese). I used two 6" x 12" (150 mm x 300 mm) rectangles of scrapbook paper, one for the bottom and another for the lid. According to the instructions, the folding sequence starts by dividing the paper into 5ths, both for the base and for the lid. For the base I followed the instructions, dividing the paper into 5 equal parts (2.4 inches each), but for the lid I folded one 2" section and then divided the rest in four equal sections of 2.5" instead (the 2" section is the one that goes inside when forming the box). With this proportions the sides of the lid are a little longer than the sides of the bottom and the lid fits nicely on it. World Origami Days started a few days ago (Oct 24-Nov 11, more information here), and Halloween is also coming soon (Oct 31). 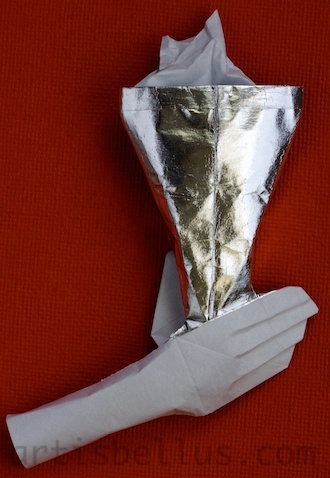 Have you considered giving origami models as Halloween treats to celebrate both events? 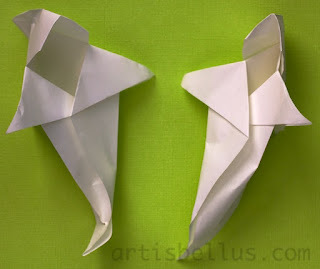 Here are two simple but very nice models that you can fold for that purpose. 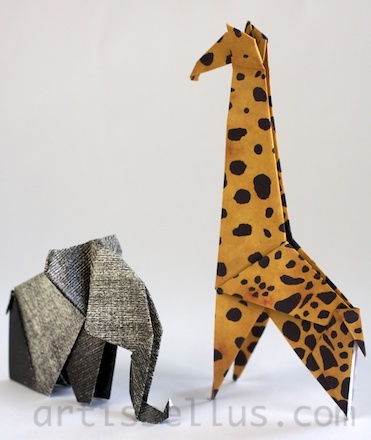 The Elephant was created by Nobuyoshi Enomoto and the Giraffe was created by Fumiaki Kawahata. The models in the picture were folded with 12" (300mm) squares of scrapbook paper, but 6" (150 mm) regular origami paper will also work. The instructions for both of them can be found in the book, Zoogami; An Origami Menagerie at Your Fingertips , by Gay Merrill Gross. 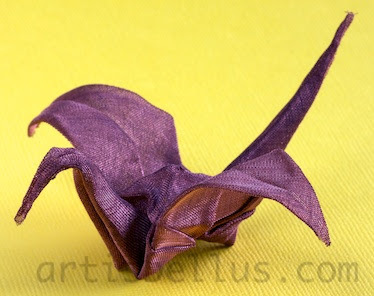 Happy World Origami Days and Happy Halloween! I don't usually fold arthropods, as they tend to be very laborious. 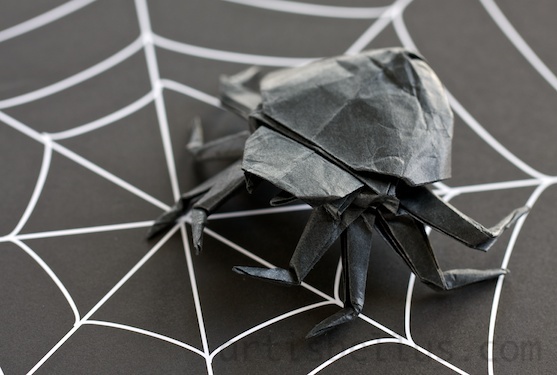 But this spider, designed by John Montroll is a nice model, perfect for Halloween, and not very difficult to fold. I folded the spider with a 9" (225 mm) black square of Pacon Paper Squares . 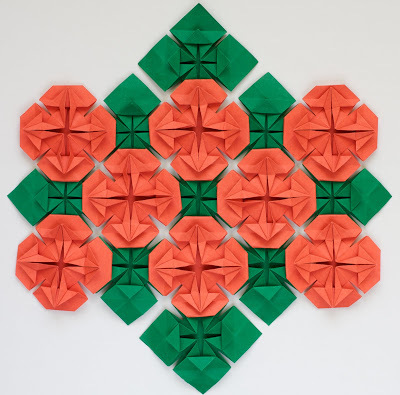 The diagrams can be found in the book, Bugs and Birds in Origami , by John Montroll. Are you looking for handmade Halloween decorations? 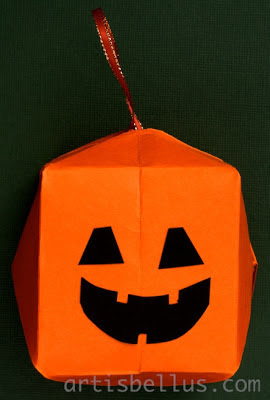 Try making this origami pumpkin. It's very simple and fun! The pumpkin is an origami waterbomb that is dressed up for Halloween. I folded it with 12" (300 mm) orange scrapbook paper and then glued black cardboard cuttings to make the eyes and the mouth. The waterbomb is a traditional model. The instructions to fold it can be found in several origami books for beginners, and also over the internet (here). These are the ones I made for the ATCs swap that will take place at the 2da Convención Nacional de Origami Argentina (Origami Argentina 2nd National Convention) on October 6th -8th, 2012. If you are not familiar with ATCs, you can find more information here. The origami goldfish is my design. 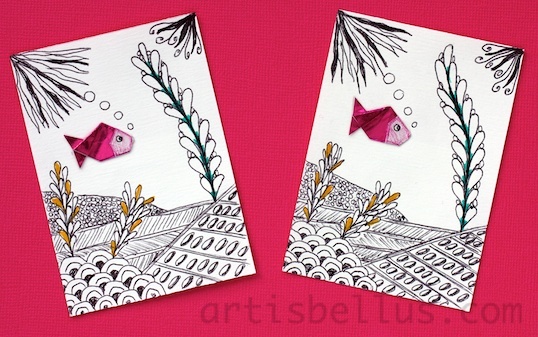 Each goldfish was folded with a 1¼" x 1" (32 mm x 25 mm) rectangle of pink origami foil paper. You can find the instructions to fold it here. I look forward to seeing the traded cards! One of the advantages of submitting diagrams to origami societies and conventions is, that if they are published, you receive a free copy of the publication. That's how I got the Orison magazine Number 4 - 2012, published by the Origami Society Netherlands, where the diagram of my model Butterfly Tato was published. It's in this magazine, that I found the instructions to make this beautiful Tower Box, designed by Winson Chan. The Tower Box is a set of stacked boxes, where the lid of one box is connected to the base of another box. It has three different sections: bottom, middle and top. I folded three middle sections, but you can fold any number of them. 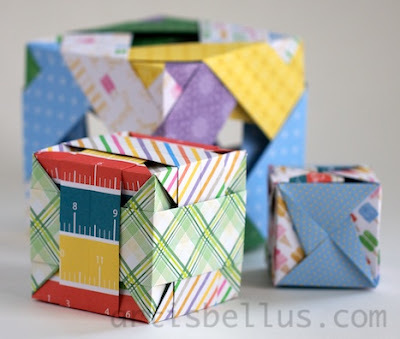 Each section of the box is folded with several pieces of paper of the same size (modular box): 5 for the bottom, 8 for each middle, and 4 for the top. I used 6" (150 mm) squares of scrapbook paper. Besides the Orison magazine, I later found out that the instructions to fold the Tower Box are also available here. 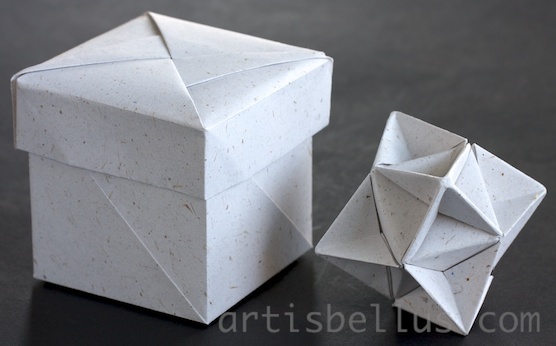 The Masu Box is a traditional origami model, that is very simple to make. 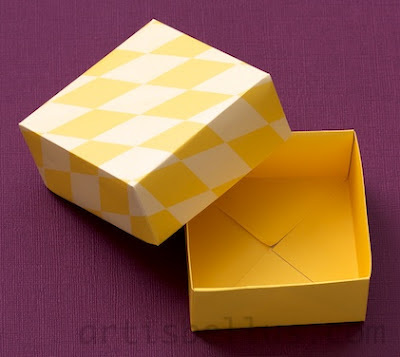 Masu Boxes are also very practical, as they can be used a gift boxes. To make them special, you can also add them dividers, as shown in the picture below. 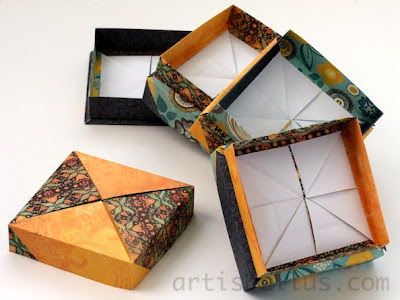 The boxes and the dividers shown in the picture were folded with 6" (150 mm) squares of scrapbook paper (one for each bottom, one for each lid, and one for each divider). The Masu Box Dividers were created by Bob Voelker. The instructions can be found in the book, OrigamiUSA - Origami Collection 2012. Since Friday, I've been mesmerized watching the Olympic Games on TV, so I couldn't help but fold something related to the Olympiads. After browsing a few books, looking for ideas, I found two appropriate models designed by Akira Yoshizawa. So here is my simplified version of a scene at the Olympic Games: an athlete preparing for the Floor exercise in the Artistic Gymnastics competition being encouraged by his coach. 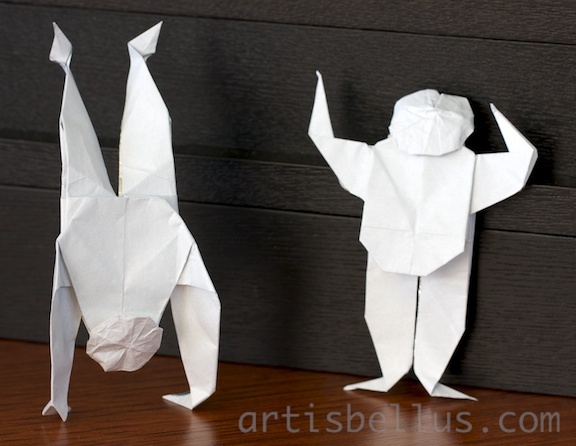 The Man, and the Man Standing on Hands, are two models designed by Akira Yoshizawa, that can be found in the book, Origami Full of Life, ISBN 4916096312. I folded each model with a 7 ½" (188 mm) square of Reynolds Wrap Non-stick Pan Lining Paper , a nice and strong parchment-foil paper. From time to time, our origami group celebrates special occasions by sharing some tasty snacks. 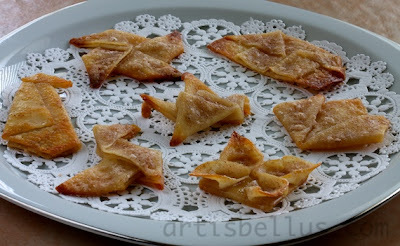 I wanted to prepare something that was origami-related, so I made these Cinnamon Sugar Crisps with an Origami Twist. I used Nasoya Won Ton Wraps, that are very thin sheets of pastry that come already cut into squares. The recipe for the original Cinnamon Sugar Crisps can be found here. I folded the pastries into simple traditional origami models before baking (windmill, house, penguin, flapping bird, tulip, pajarita, flower), to give them an Origami Twist. I brushed the pastries with melted butter, and sprinkled some cinnamon-sugar not only on the outside, but on the inside of the models too. I baked them on a greased non-stick pan. I've been folding some origami cranes with non-conventional materials. It was challenging, and I definitely need more practice, but it was really fun! 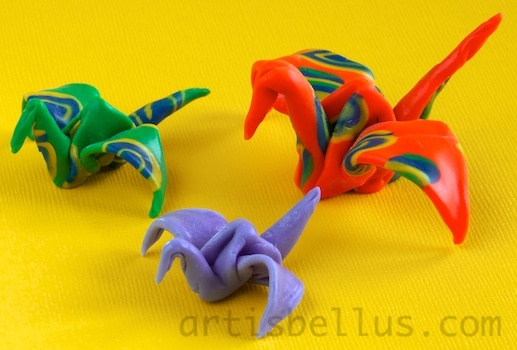 The green and orange cranes are made of polymer clay , the purple crane is made of cold porcelain . I used a small pasta machine to roll thin sheets, that I then cut into squares using a template. I dusted the sheets with cornstarch to prevent them from sticking to the machine, and also to prevent the layers from sticking to each other while folding. This last crane is made of copper wire mesh . This material was the most difficult to work with. It definitely does not like reverse folds. 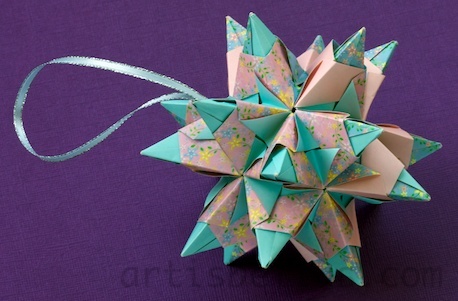 Besides paper, what other materials have you used to fold origami models? 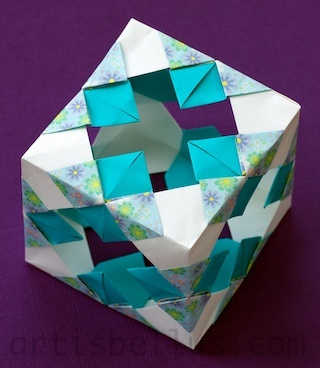 The instructions for the cubes can be found in Tomoko Fuse's book, Unit Origami Essence, ISBN 978-4817081575. Each cube consists of 6 modules. I used 6" (150mm) squares of scrapbook paper from a pack that I found on sale at the local craft store. Scrapbook paper is usually much cheaper than origami paper, and is perfect for modulars and simple models. Here is a pick of the cards that I sent this year to the Artist Trading Cards Swap organized by OrigamiUSA for the 2012 Convention (find more information about Artist Trading Cards here). I found inspiration in the book Encyclopedia of Cardmaking Techniques . 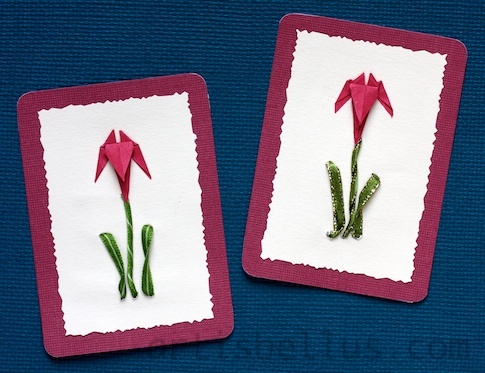 I liked the idea of using the ribbon embroidery to represent the leaves and stalk, as it gave the cards some movement. For the flower I glued an origami lily. Actually, I used half a lily in each card: I folded a lily, unfolded it, cut the square diagonally and refolded each half. It made the flower less bulky, and also allowed me to save some time. 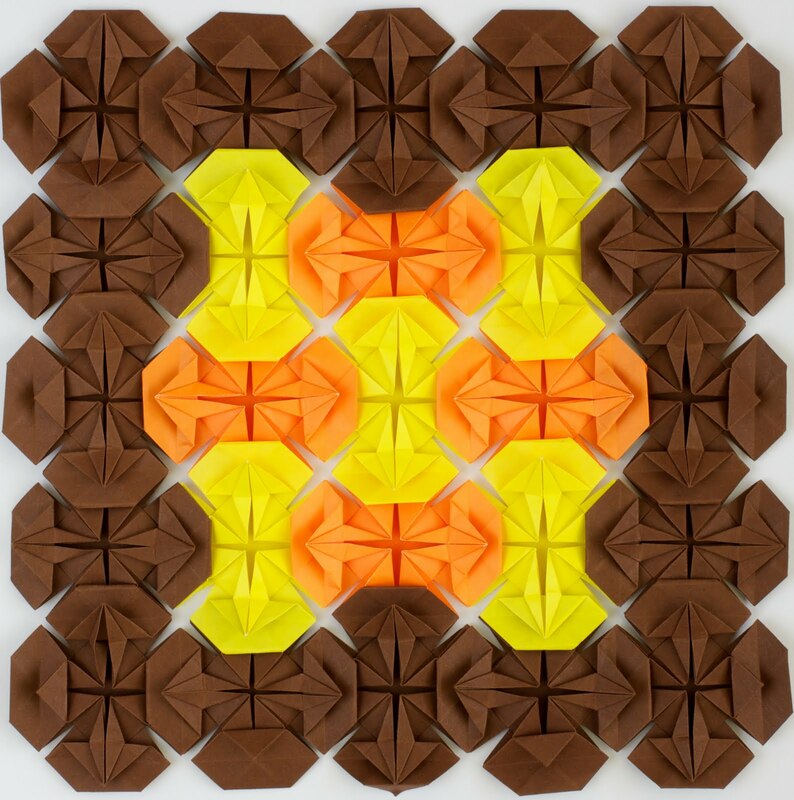 I folded the flowers with 2" (50 mm) squares that I cut from Pacon Paper Squares - 9x9 . 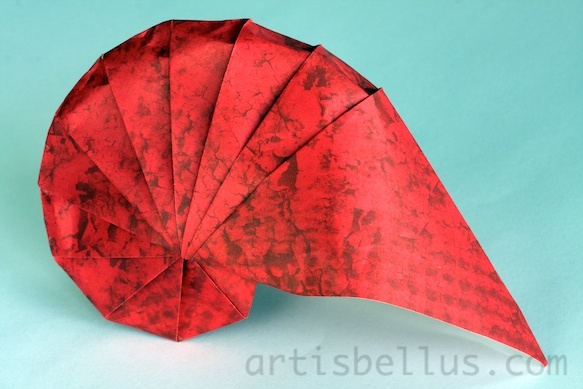 The lily (or iris) is a traditional origami model. The folding instructions can be found in many books and online sources . The Wildflowers Quilts are composed of modules which are a variation of my model Wildflower. The modules can be arranged in several different patterns, as you can see in the pictures bellow. For the yellow, orange, green and brown modules, I used 4" (100 mm) squares of Folia Colored Folding Squares ; for the white and black modules, I used 4"(100 mm) squares of washi paper.